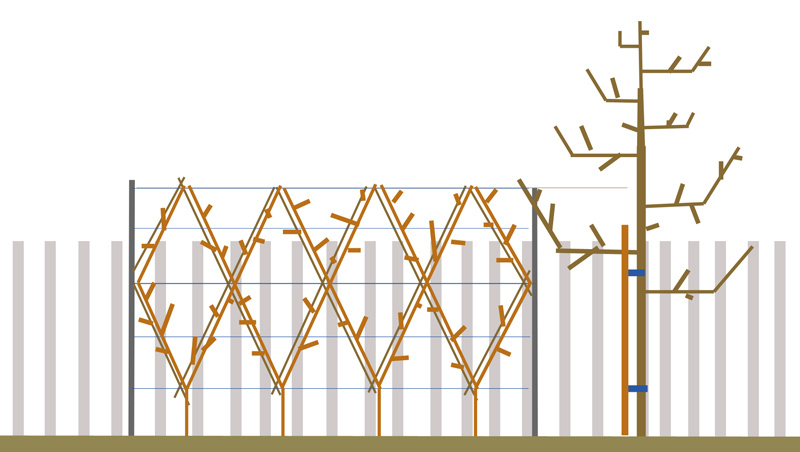 It is worth making the lattice structure of ‘Belgian Fence’ trees as wide and airy as possible. I have seen some examples where fruit quality is very poor because the lattice is too cramped and the branches become overcrowded. Also beware of canker where the branches cross one another. I grow, or have grown most of the varieties mentioned in the Belgian Fence piece. I eventually lost patience with Ashmead’s Kernel, far too much bitter pit; personally I wouldn’t eat it in November let alone Christmas. I grubbed it. As to the others, Herefordshire Russet knocks spots off Egremont Russet; it is very tangy, but needs thinning. Contrary to its reputation Egremont Russet is not scab resistant, the leaves are quite prone. Last year Scrumptious lived up to its name: at a orchard tasting a friend described it as scrumptious and asked me its name – ‘Scrumptious’ I said. Red Windsor is scab resistant, a good cropper and has excellent flavour, a ‘must have’, in my opinion. Blenheim Orange is extremely vigorous, an M27 root-stock would be recommended. The M27 root-stock also produces better colour. The M9 root-stock seems an excellent choice for the rest. Any soil conditioners added to the soil will mean trampling down the soil in the planting hole,thoroughly. Otherwise,the soil level will sink in the first year or so, leaving a hollow round the tree, although this is very handy for watering. Another good cropper and with Cox’s Orange Pippin in its parentage is the Danish apple Ingrid Marie. It is also scab resistant. The main problem with trees in restrictive form is that for the first few years you are very often pruning off the following years fruit as they can be tip bearers or partial tip bearers. Eventually you will build up small side shoots with blossom buds- keep at it! Over the past 14 years I have helped maintain an extensive Belgian Fence in a walled kitchen garden in Essex. This contains 60 trees (20 varieties) on MM106 rootstocks planted 1 metre apart in 1999. Varieties that have performed well have been those that spur freely and have moderate vigour, eg. Scarlet Nonpariel, Yellow Ingestrie, Winter Pearmain, London Pippin, Adam’s Pearmain, Court of Wick, Kerry Pippin, Worcester Pearmain, King Charles Pearmain, Keswick Codling and Beauty of Bath. Very vigorous varieties like Blenheim Orange and George Carpenter and tip bearers like Irish Peach and Cornish Gilliflower have performed very poorly and should be avoided. Bob’s comment about ensuring good light and air circulation is very important to reduce the risk of disease, especially scab. Many thanks for the detailed responses. I’ve taken the comments on board and decided to drop the Egremont Russet and stick with Red Windsor, Scrumptious, and Herefordshire Russet. Given comments on keeping spacing light and airy, I’ve decided to increase spacing to 1m, so just have three tree in my 3m run. Having dug down further I’ve discovered that the topsoil is only 12″ deep before hitting building rubble. I’m intending to dig some of this out to create more depth (I can’t just build up on top because soil would spill in to the neighbours garden). It’s heavy going and I’m wondering how deep to go – I’ve read conflicting reports on how deep the roots will go. 18″? 2ft? I’m using M9 rootstock. Bare in mind the neighbour’s garden, and my own veg, will be front and back so I want to encourage the roots to go down rather than out as much as possible. Also in terms of the soil mix – some further advice would be very helpful. I’ve read lots of comments saying not to feed the soil unless necessary. But I’m having to add something to increase the depth, so will need to buy in some bags of something. Have found now that the soil is more loamy and free draining than I initially thought. In fact drainage is remarkably good – after all the heavy rain this morning, the soil was still digable and water runs straight through rubble base layer. This area was previously a very overcrowded evergreen bed – ornamental plum bush etc. So I’m guessing now pretty devoid of nutrients. I do have some bags of coarse sand that I dug from under brick paving (there might be some traces of loose concrete mix in this). So given a fair amount of clay, I’m wondering whether to incorporate some of this? Otherwise would it be a problem adding in a lot of commercial compost, or soil improver, or manure, or is this likely to be too rich? Bags of top soil better? (given variable quality of bagged stuff)? One last query – Mycorrhizal fungi anyone? Here it is nearly March so you must’ve planted a year or so ago, what did you wind up using for soil amendments? Even if you didn’t use fungal inoculant when planting you could work it in as a top dressing without hurting anything. Having had my best ever tomato crop this past year using a mixed inoculant fertilizer I am a fan. What about a heavy mulch of whatever high nutrition hay is available? Here in the American west I use alfalfa. Straw can work but hay tends to stay in place better. Five years ago I planted 32 apple (4 varieties) trees on 2′ center grafted on M111. Conventional wisdom would suggest that is too vigorous but so far doesn’t seem to be. This fence doesn’t get much morning sun or the best evening sun but 3 of the varieties have given modest crops the past 2 years. The fourth variety almost all 8 trees were too small to be planted out and with a neighbors invasive shrubbery have struggled. Here’s hoping you got your fence planted and that it proves as satisfying as ours. Yes, thanks for enquiring, I’ve had it in mind to post an update. Soil improvements before planting were a mix of: general purpose compost, soil improver, garden compost, bone meal – dug down about 60cm deep and at least a 60cm wide hole. Probably fairly rich but the roots are quite restricted. Yes, used Mycorrhizal fungi. I used a mulch of barley straw over the summer. Just refreshed with bark now, and pruned back the weaker growing 2 trees by a third on each branch, to outward facing buds. On the pruning, would I be right to prune back more or less in order to balance out the more vigorous growth against the less vigorous? That is, leave the strongest limbs un-pruned, and prune back harder on the weaker trees? Once the new shoots reach the widest part of the diamond on the outer edges I guess I will prune again to get a shoot to cut back in. Should I wait for late summer for this, or next winter – to stimulate stronger growth? Also any thoughts on a feed? – I’ve top dressed with garden compost – should I feed too? There were some signs of yellowing between the leaf veins – but this was fairly late in the year so I’m not too concerned. Reading up though, could be result of over-feeding possibly?